Chancellor Angela Merkel has been trying to form a coalition government since September. Germany's Social Democrat party voted Sunday to enter coalition talks with German Chancellor Angela Merkel's party. Germany has been in political deadlock since the country's election in September. No party received enough votes to form a government. Initially the Social Democrats said they wouldn't work with Merkel or her Christian Democratic Union party, but in December the party voted to begin negotiations. In January, those talks led to the beginnings of a coalition deal. Many Social Democrats are worried the initial talks weakened their political position too much. 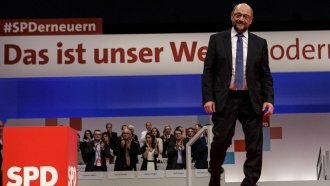 But party leader Martin Schulz promised he'd negotiate more platform concessions from Merkel in this next round. Once it's all done, the Social Democrats will hold a final vote to approve the new coalition.